All along Austin’s roadways, bluebonnets are making their annual splashy appearance. 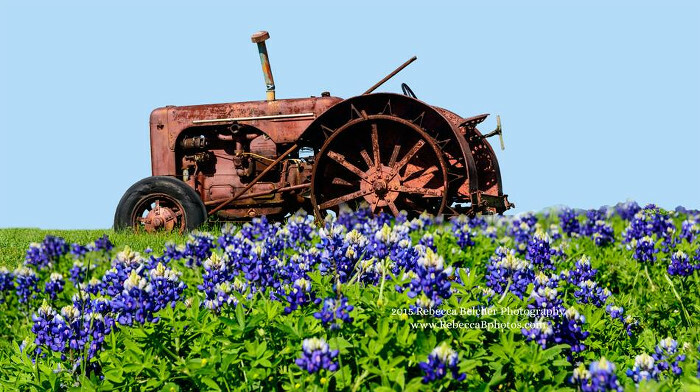 Thanks to Lady Bird Johnson’s efforts to beautify the state’s highways, generations of Texans have grown up with a shared rite of passage, taking the family portrait in fields full of the state flower. 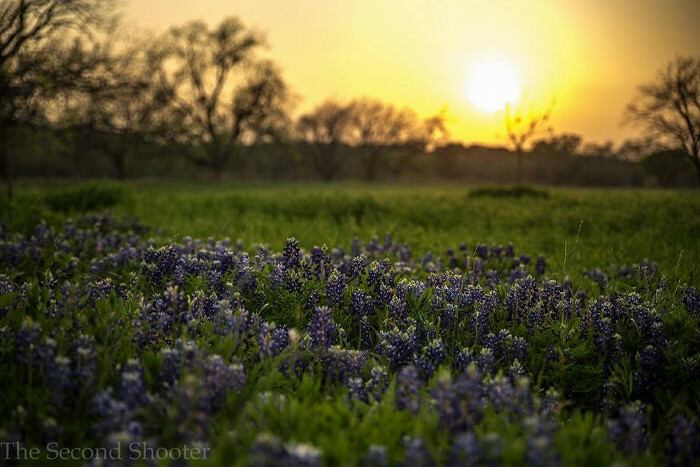 Where Can You Find Bluebonnets? There’s an approximate two- to four-week window every March and April for catching sight of these wildflowers. Just how long they last and how spectacular their blooms become depends on the preceding winter’s rain and cold. It’s hard to anticipate exactly where and when bluebonnets will appear. A good strategy is revisiting places where you previously found flowers. That’s because it takes years for bluebonnet seeds to germinate. The plants reseed each season. The tan, fuzzy pods turn brown, fall off and seeds pop out to spread. To encourage more bluebonnets in a field, it’s important to wait until at least half the pods have turned tan before mowing. Big fields have a continuous cycle of germinating seeds from many years. Here are three websites to check that give wildflower bloom updates: wildflower sightings.org, bluebonnetlove.com and wildflower haven.com. Keep little ones and pets from putting plants in their mouth. 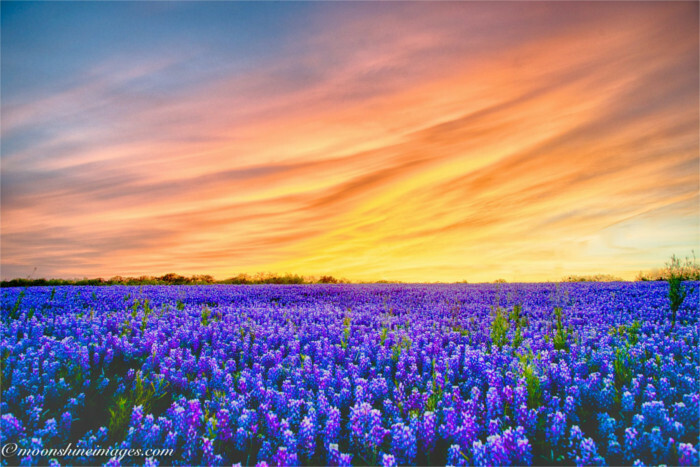 Bluebonnets are toxic to humans and animals. Leave the flowers as you found them. 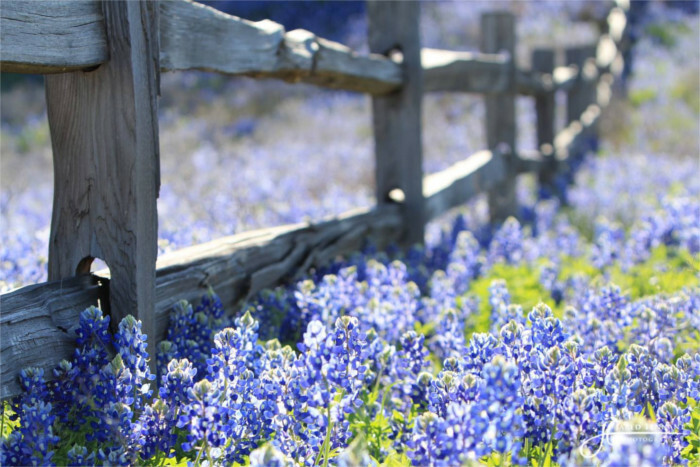 It’s not illegal to pick bluebonnets, but it is illegal to mar or take someone else’s property. Drive thoughtfully – park legally and carefully re-enter traffic. Look for a safe walkway. It is illegal in Texas to walk on a highway or highway shoulder. Watch out for bees. Especially for those with allergies, stings could mean trouble. 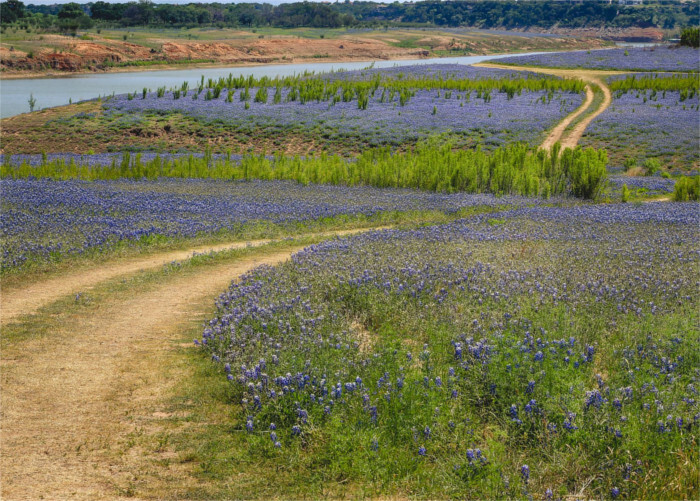 Take advantage of Lady Bird Johnson Wildflower Center’s bluebonnet areas. Their special stands were created to provide a safe place for snapping pics away from traffic. Would you believe this photo was taken on William Cannon, a heavily traveled urban thoroughfare in Austin? Adding these annuals to your landscape is easy and beneficial. 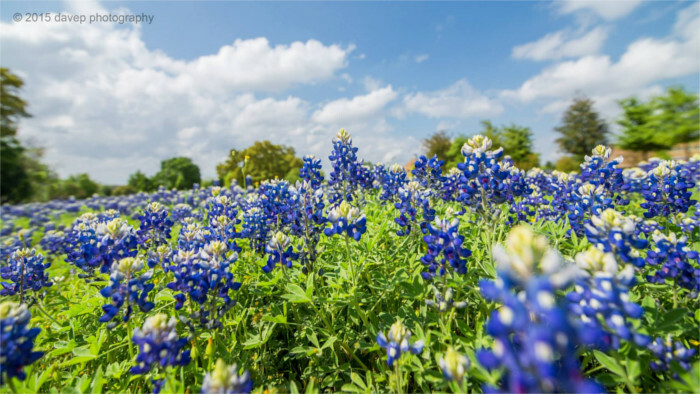 Native plants use less water and require less care (in fact, fertilizing bluebonnets results in more leaves than blooms). They don’t even need quality soil, so they’re perfect for problem areas that get lots of sun. And bees and butterflies will thank you. Bluebonnet seeds should be sown in the fall, after the first rain. Simply scatter seeds over the area, lightly cover with soil and give a gentle soaking of water. Seeds sown naturally take two to three years to germinate. Scarification–the botanical term for breaking open tough seed pods–speeds up the process. If nature is too slow, either freeze harvested seeds before dousing with boiling water or soak them in water overnight before planting. Or buy treated seeds from seedsource.com, which will help support the Lady Bird Johnson Wildflower Center. You can buy bluebonnet transplants at local garden centers (I found some at H-E-B, a great resource for inexpensive herbs). Give them plenty of sunlight, water when dry and just leave them alone. When the plants are dead, simply shake the seeds over the ground as you pull them out. Plan to plant again the following year…and repeat. The Texas Highway Department has more tips on planting bluebonnets. They should know–for more than 60 years, TXDot has been sowing seeds, putting out 30,000 pounds every year and keeping Texas beautiful. Let’s see your bluebonnets! Share your photo in a comment and tell me where you found your flowers.